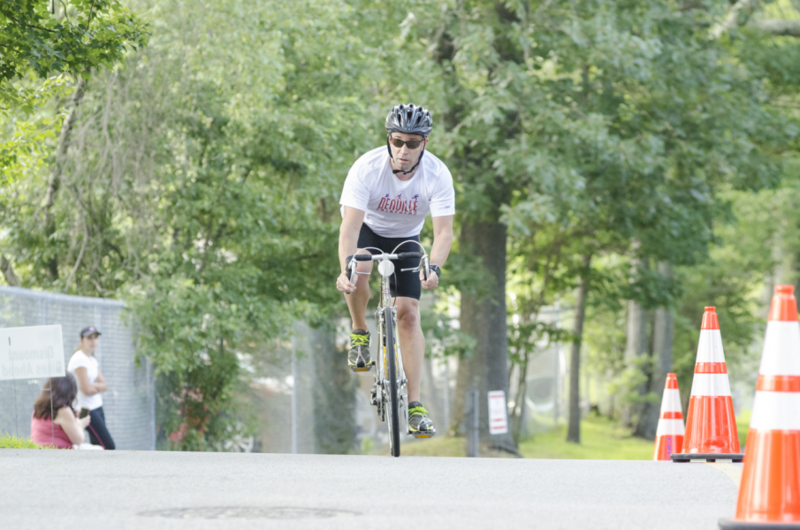 Register for the Denville Sprint Triathlon today! 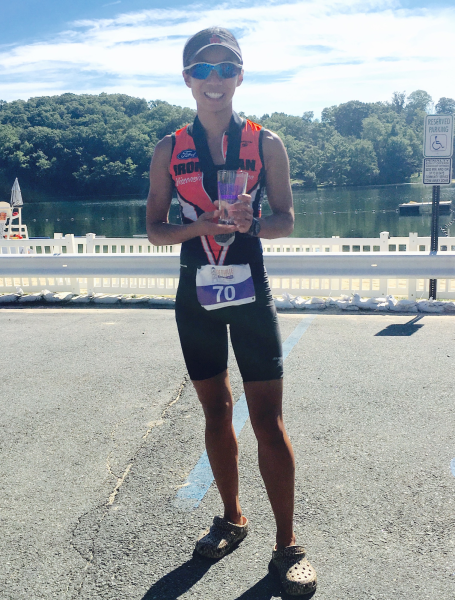 This is the seventh Annual Denville Triathlon Event! For anyone who has not done our event, this is a great tri for first-timers. The “V” shaped swim is .35 miles in Cooks Pond, a very pretty and clean local lake. The bike leg is a 9 mile flat route (double loop) through the downtown area (roads are closed). And then there's the run — it's a 5K and it does start with a killer hill, but we have lots of fans to cheer you on and the course goes through a lovely local neighborhood. This will be an individual and relay event. Proceeds from this event benefit local charities, including the Joey Bella Memorial Fund. The swim is set up as a .33 mile U-shaped swim in Cooks Pond. Athletes enter from the beach, swim past the dock and then swim counter-clockwise around buoys. Click here to view the Bike Course. The bike course is a 9 mile DOUBLE LOOP course through downtown Denville. Exit Cooks Pond, turn left on Entrance Way, right on Diamond Spring, left on Pocono, left on Old Boonton Road, left on Bush Road and then left onto River Road. At the end of River Road you will make a left onto Diamond Spring to complete the loop again. This time at the end of River Road you will make a right on Diamond Spring Road, then a left on Entrance Way. Slow down as you head up the small hill and prepare to make a right into the Cooks Pond Transition Area. There will be no water stops on the bike course. Click here to view the Run Course. The run course is a hilly 5K through a Denville neighborhood. Exit Cooks Pond through side gate and make a left onto Lake Street and then make an immediate right on Entrance Way, right on Summit Drive, right on Barnes Pass, left on Whale Back Waddy, left on Canyon Road, left on North. Make 2nd left on Summit, right on McDermott Pass, right on East Glen, left on North Glen, left on West Glen, left on Florence, right on Mulberry Lane, left on Winding Way. Cross over Florence onto Edgewater, make right onto path by Rock Ridge Lake. Right at the lake and go over small bridge, pass clubhouse on your left and continue straight over gravel road, right on Entrance Way. Finish Line on Entrance Way before Cook’s pond Entrance. There will be one water station on the run course. All entries are non-refundable and non-transferable. No refunds will be given – no exceptions. If the race should be cancelled due to weather, act of God or other issues, no refunds are possible as many costs have already been incurred in preparation of the event. Early bird registration price of $75 for individual athletes valid until January 31st, then price increases to $85 until 5/1. On May 2nd the price increases to $90. Three person relays (cost per person): $40 until May 1st, then $45 each. Two person relays (cost per person): $60 until May 1st, then $65 each. Online registration closes on Monday, July 16th. Only if there are spots available, race day registration will be available for $100 (cash only). There are 300 spots available (individual and relay combined). Registration includes t-shirt and goodie bag, as well as post-race food and beverages. To be guaranteed a t-shirt you must register by May 20, 2019. Shirts are available in men's and women's sizes and sizing information is available during the registration process. Although this is not a sanctioned USAT event, we will be strictly enforcing all USAT rules. Go to www.usatriathlon.org for a complete list of triathlon rules. Course is subject to change before the event. Parking maps will be emailed to all participants before race. Certain portions of the course will be closed to traffic but athletes must always be aware of cars and pedestrians. Be familiar with race routes before race day, especially the bike course, which consists of two loops and several merging points. Prizes will be awarded at the end of the race. An athlete newsletter prior to the race will provide additional details. 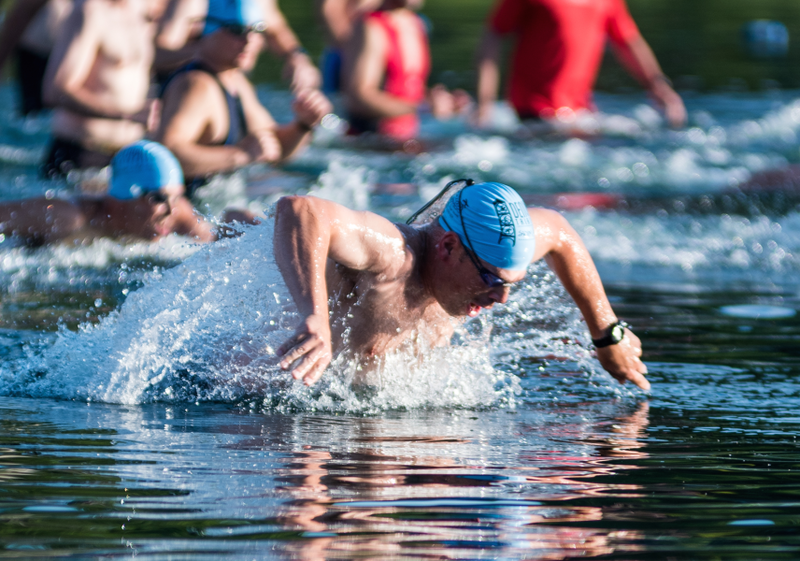 You must be a member of Cooks Pond to swim there prior to the race. No one is permitted to swim in Cooks Pond when lifeguards are not on duty. 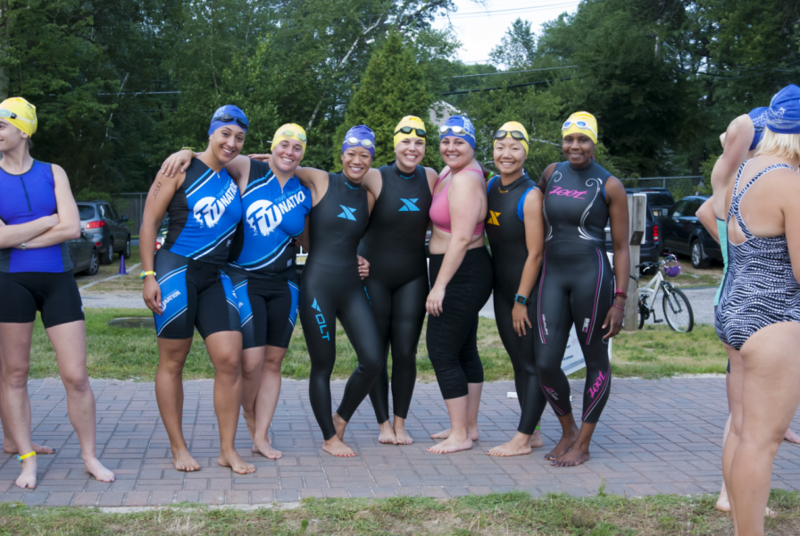 You do NOT need to be a member of Cooks Pond to participate in the tri. There will be no swim warm-ups allowed on Race Day. During the swim you may float holding on to a kayak, but no forward progress is allowed. Bike helmets are required and must be properly placed on the head and fastened before the participant first mounts the bicycle, at all times when on the bicycle and must not be unfastened or removed until the participant has dismounted. You must walk your bike out of the transition area and mount/dismount when directed by race volunteers. Do not ride your bike back onto Cooks Pond property at the end of the bike leg. All handlebar ends must be solidly plugged to prevent injury. It is your responsibility for knowing and following the cycling course. Always ride on the right side of the road. All participants must obey traffic laws while on the cycling course. No drafting during the bike race. Keep 3 bike lengths between you and the person ahead of you. Do not block by riding side by side. If racing with a friend you must have one ahead of the other with at least 3 bike lengths distance. Music/iPods/headphones are not allowed any time of the race. There will be one water stop on the run course. The course is hilly. Please use caution ascending and descending hills. Where can I find more information about the Joey Bella Fund? Please click here to learn more about this charity. You may also add an additional charitable contribution when you register. 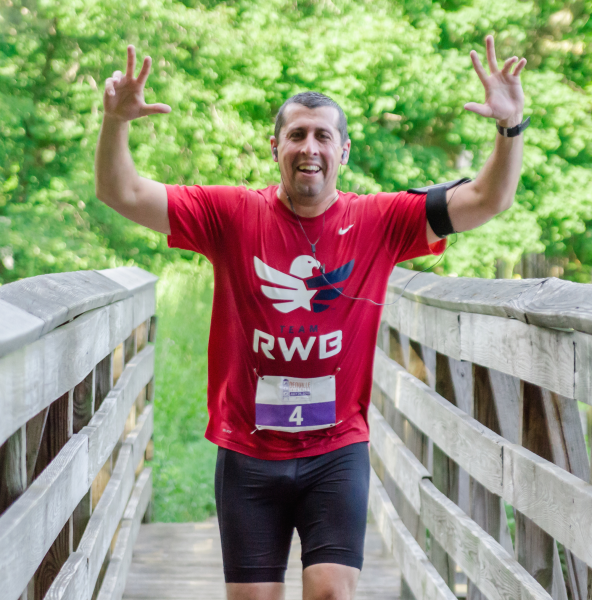 What are the distances for the Denville Tri? The swim course is a triangle-shaped 0.33 mile swim. The bike course is a 9 mile double loop course, which is fast and flat. The 5K run is hilly and challenging but goes through a beautiful local neighborhood. Is this a USAT certified race? It is not a USAT certified race, but we will be following USAT rules which can be found here. The race is limited to 300 athletes. We will allow Race Day registration for $100 per individual only if we are not sold out. If I cannot do the race after I signed up, can I get a refund or transfer my registration to someone else? Sorry, race policy is no refunds or transfers. What time does the transition area open? The ANYTIME FITNESS transition area opens at 5:00 a.m. on race day. Race packets will be available prior to race day. Stay tuned for more details on pick-up times and locations. Will there be food and water at the race? There will be a water stop on the run course but no water on the bike course. We will also have snacks and drinks for all athletes after the race. There will also be an after-party at Thathcher McGhee’s, a local Denville restaurant. Yes, full and sleeveless wetsuits are usually allowed but it depends on the water temperature on the day of the race. How do relay teams work? A relay team must consist of two or three members and all team members must check in at registration. A relay team is assigned one bib number and team members must transfer the timing chip at the transition area between each portion of the race. When you register for the race, you must select if you are a 2 or 3 person relay. Will anyone be taking pictures on Race Day? Yes, we have a local photographer, Shoot2Please, who will document the event. We will send all athletes information on how to access the photos. Check out last year's event photos to see what a great time everyone had. Please email denvilletriathlon@gmail.com if you’d like to volunteer.